I’m with Al about light in the shop. Natural light is way better than just about anything you can buy. I thought maybe the poly green house panels They do have some insulating value. @BillSchiller They make poly clear panels. Put them on the side, and on the inside put hinged insulate panels that can be open or closed for extra light or keeping the heat in durning cold winter months. The panels could be hinged from the top and a rope on a pully would pull the panel open. You would have so much light in the day time in that shop you could have indoor gardening, fresh greens. The wife would like that. There are polycarbonate panels available profiled like cladding, UV stabilized. For 3 season only use, I would say the polycarbonate would be fine, not as much for a warm shop building. I have some of these. They work really well. I could have other 110V LED’s as a backup. as I do in my shed. 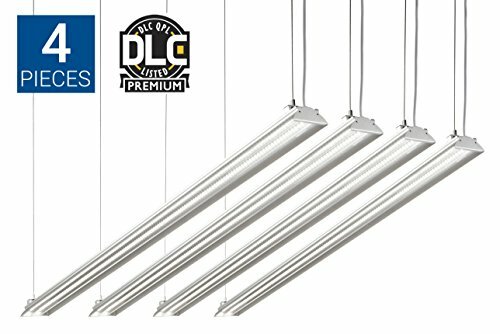 The Chinese are now selling 12 volt LED standard style light bulbs as cheap as the 120 A.C… For a stand alone system can’t get any simpler or more efficient than that. 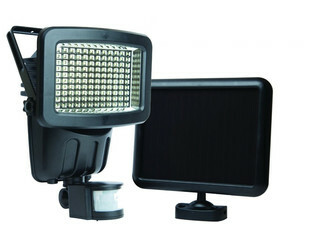 hard to go wrong with that… I just bought retrofit led bulbs from costco because I already had the 4ft fixtures. By the time you add in those things you might as well install a 300 watt inverter for the lights if there is a buildings worth of them and just buy stock 120 ac bulbs. If a standard AC switch is rated for 15 amps, or 1,800 watts, there’s a reasonable margin there for derating, given that a DC 60 watt equivalent bulb will draw about 8 watts. I would be concerned about the longevity of a.c. contacts, but the switches are cheap. As are DC.switches too. If they are U.L. rated is a good point, which I guess depends on how off grid a person is. Yes, fuses should be used on DC, contrary to conventional wisdom fuses are much superior to circuit breakers. 8 watts at 12v is 2/3 of one amp, the currents needed for practical lighting are minimal. I believe you had previously mentioned that dc systems below 150W? are outside of code requirements anyways? I personally am not too concerned about circuits far below typical automotive ones. My main point here is efficiency. A straight dc system avoids inverter losses, and rectification losses, the power will be used roughly 40% more efficiently. That means lights on longer, or smaller solar array, or smaller batteries. To me that scale of energy and materials savings is a big plus. Bill, I have standard 2 bulb shop lights in the shop, these seem to be at lest twice as bright. 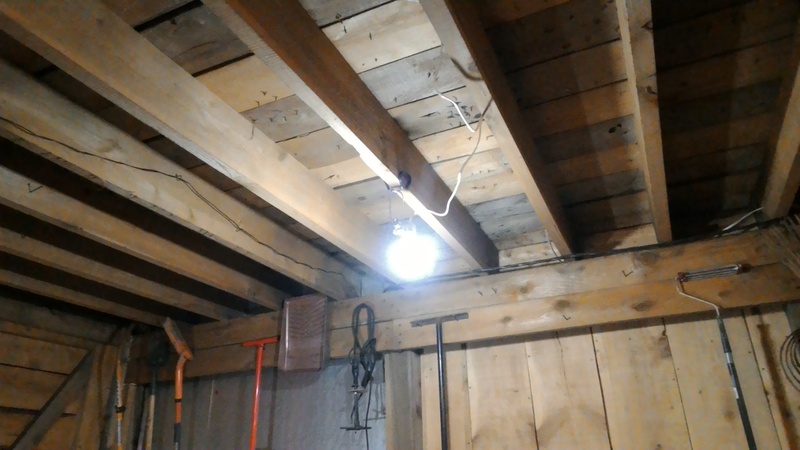 I replaced all my fluorescent shop lights with LED bulbs. Used carpenter clamp on stud fixtures. This is how I secured the last sheet of tin. 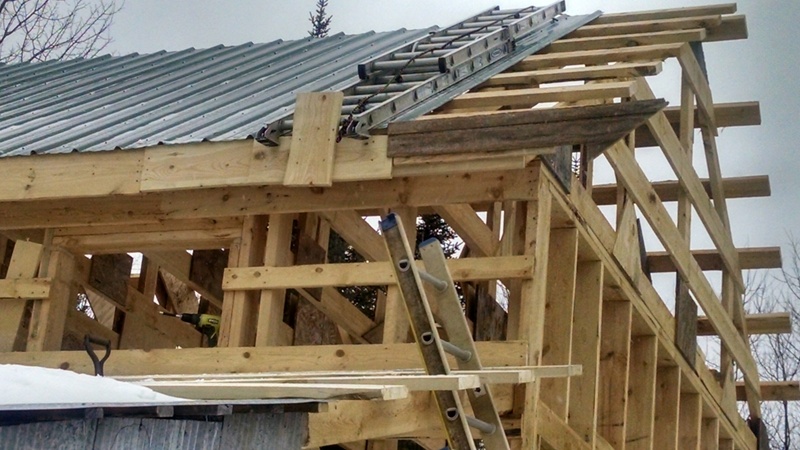 I used a board for a spacer on the fascia board to compensate for the overhang of the tin. Then I screwed a board vertical to lock the ladder rung on to. 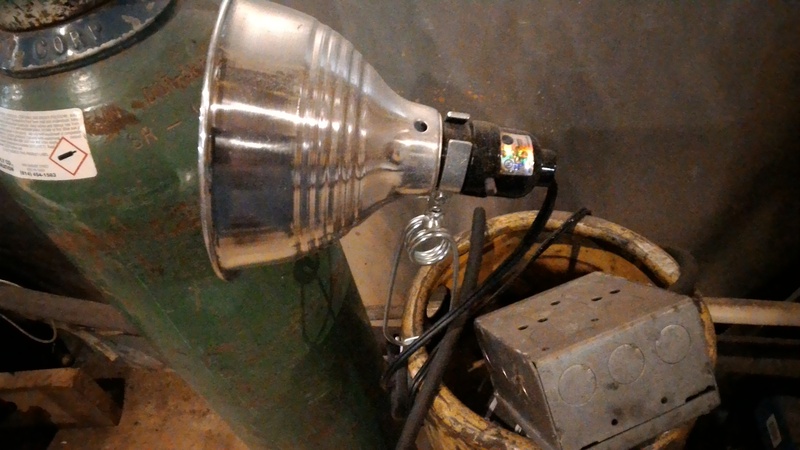 Here is my shop lighting. On the ceiling I do not use the reflectors because I get more light if the ceiling is lit. Winter with Sub-Zero weather slows this guy down. It hasn’t stopped me though. We’ve been waking up to -15 to -30F just about every day since Christmas. I now have all the tin on including the roof cap. The guy that has been providing me with the rough cut lumber has also slowed down. Today it warmed up to 23F. 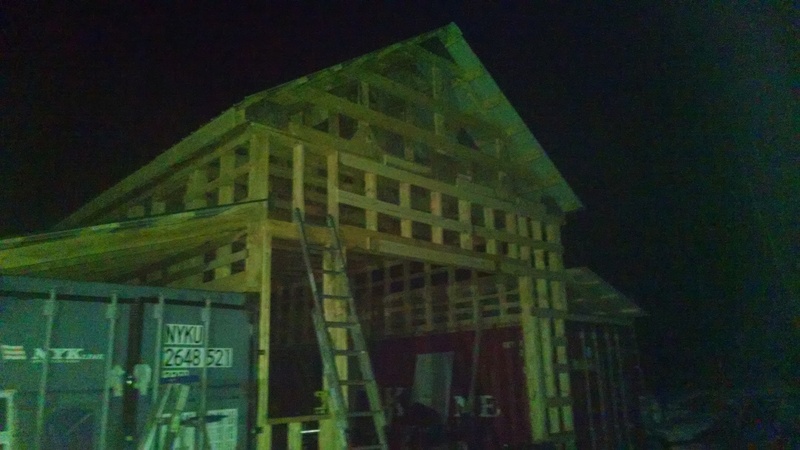 I was able to start the skid steer and sawmill with no problems. 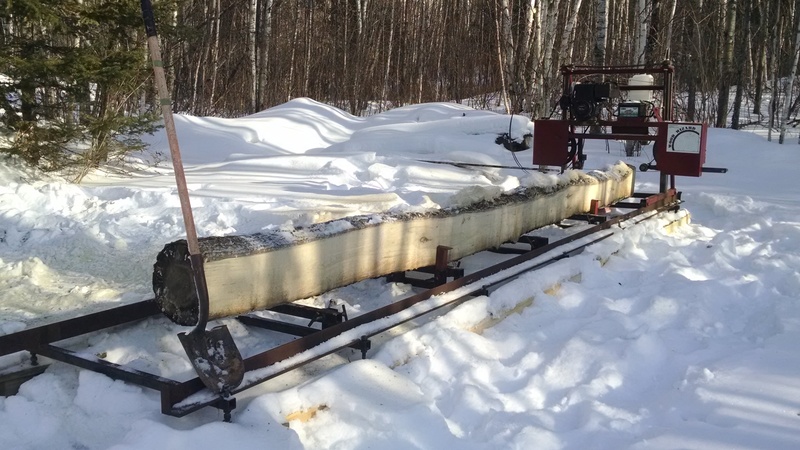 I dug a log out of the snow and placed it on the mill. I was able to cut a bunch of 1x6’s for the laterals to attach the board and batten to. I couldn’t for the life of me find the log cant. I used a #2 shovel to turn this 17’ log. We’ve been waking up to -15 to -30F just about every day since Christmas. After reading your post I promise not to complain about our rain,mud and 60 - 70 F weather. Yes, what Wayne said, I agree.